This Tuscan Wild Tomato Panzanella with a tangy and salty lemon-dulse-basil Dressing, capers & roasted pine nuts simply bursts with flavour. It’s one of my favourite dishes. It’s bright and colourful, fresh and summery. This is my take on the classic Italian bread and tomato salad but without the bread. I have used oat cakes instead which add an interesting texture and a hearty flavour. 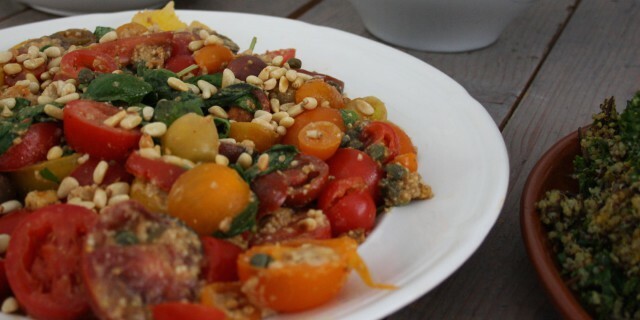 You can serve the Tuscan Wild Tomato Panzanella as beautiful side-dish, starter or as a light lunch. I recently served the Panzanella at the 7DayRecharge book launch and this dish was one of the favourite dishes amongst our guests. Cut the tomatoes in halves and place them in a large salad bowl. Add the capers, oniong rings and crumbled oat cakes. Add all dressing ingredients to a food processor and procress until you have a thin dressing. Add a little water if necessary. Pour the dressing over de tomato salad and mix well. Serve with roasted pine nuts and fresh basil leaves. Sprinkle with extra virgin olive oil to taste.